Kinder Morgan is close to pulling the plug on a planned expansion of its Trans Mountain crude oil export pipeline, designed to provide the land-locked province of Alberta with opportunities to send 590,000 b/d of heavy and light barrels to refineries in Asia and the US West Coast, in the face of relentless opposition from stakeholders that is now threatening to erode its shareholder value, the company said Sunday. Already some C$1.1 billion ($860 million) has been spent on the project since its initial filing with the federal regulator the National Energy Board in 2013, it said, noting going forward no additional shareholder resources will be committed. The expansion was estimated to cost C$7.6 billion and is aimed at putting 600 miles of new pipe to the ground, installing 12 new pump stations and three export berths at Vancouver, Kinder Morgan said in mid-February. At the time it said the project was targeted to start up in December 2020, a year later than earlier forecast. That scenario changed Sunday, which Kinder Morgan attributed to project opposition by the province of British Columbia and a failure of the federal government in Ottawa to resolve the issue, despite the planned pipeline expansion already receiving regulatory and government approvals. "A company cannot resolve differences between governments," Kinder Morgan CEO Steve Kean said in a statement. "While we have succeeded in all legal challenges to date, a company cannot litigate its way to an in-service pipeline amidst jurisdictional differences between governments." 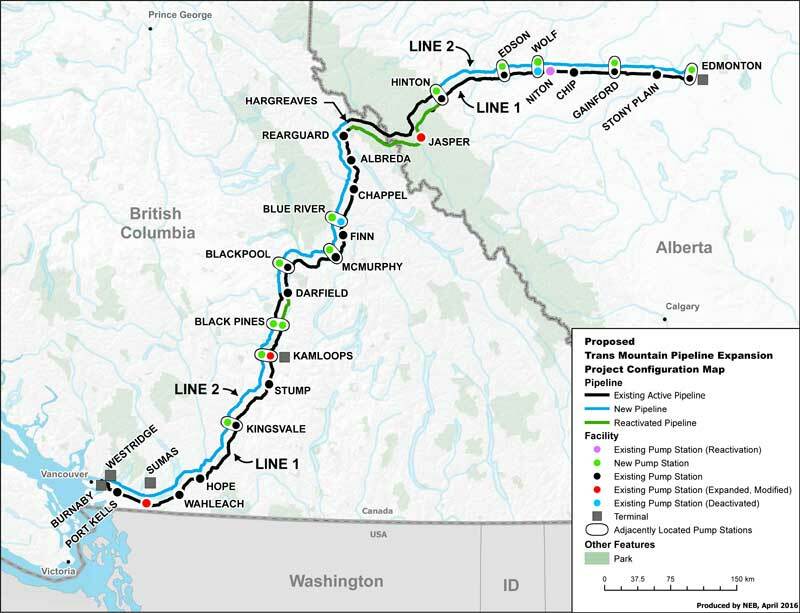 Despite the expansion being backed by the Alberta and the federal governments and a bulk of the stakeholders along the pipeline route, including 43 First Nations bands, the fact remains a substantial portion of the pipeline must be contracted through British Columbia, Kean said. Since a change of government in British Columbia in June 2017, that government has been clear and public in its intention to use "every tool in the box" to stop the project, he said. The uncertainty created by British Columbia has not been resolved, but instead has escalated into an inter-governmental dispute, Kean said. "While we are prepared to accept the many risks traditionally presented by large construction projects, extraordinary political risks that are completely outside of our control and that could prevent completion of the project are risks to which we simply cannot expose our shareholders," said Kean. Disallowing Kinder Morgan from expanding the Trans Mountain pipeline by taking the matter to court was one of the promises on which the New Democratic Party had fought elections, said Peter Howard, chairman emeritus with the Canadian Energy Research Institute. Since taking over power, it has spared no effort to throw spanner in the works and ensure delays in starting onsite construction work, Howard said. "Section 19 of the Canadian constitution says energy projects that are of a national interest are guided by the federal government rather that a province," Howard said. What the British Columbia government has done now is effectively challenged that section, Howard said. "We campaigned with a view to protect our coast, land and water," British Columbia Premier John Horgan, told reporters on a webcast. "The Prime Minister [Justin Trudeau] has said this is a project of national importance. But we respectfully disagree. We believe the risk of an environmental spill is too great." Alberta Premier Rachel Notley said the province will do whatever it takes to get the Trans Mountain pipeline expanded, including taking a stake in the project. "We are prepared to be an investor," she told reporters in a webcast. "This pipeline must be built and a federal approval of the project must be worth more than the paper it was written on. Ottawa needs to set up." Trans Mountain Expansion is in the national interest and the Canadian government is determined to find a solution, James Carr, the federal natural resources minister, said in statement, without giving any details. Kinder Morgan will continue talks with shippers and its shareholders until May 31 before taking a final call on not moving ahead with the planned expansion, Kean said. The project is underpinned by firm 15-20 year firm commitments and has the backing of about 13 oil sands producers including Cenovus, Imperial Oil, Suncor, Total, Husky Oil and Devon Energy. No comments were immediately available from these shippers. Japanese refiner Cosmo Oil, which has said it is interested in taking Alberta's diluted bitumen once the expanded Trans Mountain pipeline starts up, said Monday it was still gathering information on Kinder Morgan's announcement Sunday. Cosmo Oil will continue to monitor the fate of Trans Mountain expansion, as well as pay close attention to Canadian crude exports, said an official at parent Cosmo Energy Holdings. Cosmo Oil said earlier it sees Canadian crudes as not only helping diversify its supply sources, but also in line with the Japanese government's new regulatory directive to process more residues from heavy crude oil. The company also sees Alberta's bitumen exports from Vancouver on Aframax tankers helping to increase its oil procurement flexibility as the imports will take around 11-12 days, compared with close to 30 days from the US Gulf Coast via the Panama Canal.